Keep up to date with the latest news and events that are taking place in the diocese of Turin. This is one of the most revered and one of the most controversial symbols in the Christian community. The Shroud, which has been stored in the Cathedral of San Giovanni Battista in Turin Italy since 1578, is believed to be the burial cloth of Jesus Christ. This is the official Web site for the Holy Shroud. It contains news, documents, studies and resources all devoted to this Holy Linen. Vittorio Amedeo II made a vow that he would erect a large church in the honour of the Madre del Salvadore if his army could resist the French troops of Luigi XIV. 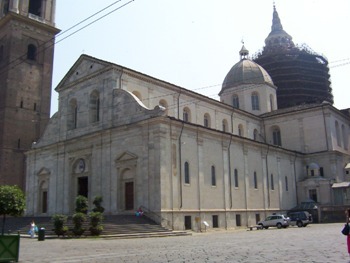 The Basilica was opened to the public after 14 years of work on the 1st of November in 1731. Each church listed includes hours, mass times and a brief description in English, French and Italian. The Turin Cathedral is the major Roman Catholic church of Turin and it is dedicated to Saint John the Baptist. Within the Duomo is the Chapel of the Holy Shroud, which is the current resting place of the Shroud of Turin. Antonio & Dante are heading to the capital of the Piedmont region, which also happens to be the fourth largest city in Italy. What popular destination do you think they will visit? Join them to find out.